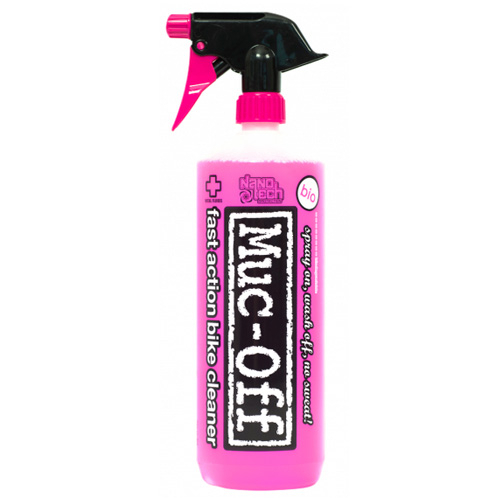 Using state-of-the-art Nano Tech formula, Muc-Off cuts through grime quicker than you can say “OMG!” regardless of the weather or riding conditions. This classic pink Bike Cleaner has incredible cleaning power because it contains revolutionary Nano Technology that breaks down dirt and grime on microscopic levels, while also caring for your bike’s delicate finish. Because we use the finest ingredients and surfactants, our Muc-Off formula is a closely guarded trade secret. It’s the most effective cleaner out there, and it doesn’t even need any of those nasty, dangerous acids or chemicals. In fact, our perfectly pink cleaner is biodegradable, free from acids, CFC’s and solvents, and it’s alkaline based so you can clean away with a guilt-free conscience. Only available to UK customers.